This morning, I read an article from a local news website (Millbrae Patch) that told about a 2-year old boy named Jeremy Kong, who is fighting Leukemia. Jeremy needs to find a bone marrow/stem cell donor, and so far, no match has been found. Since the markers used in matching are inherited, patients are more likely to match someone from their own race or ethnicity, and there is a critical shortage of minorities in the National Marrow Donor Program. The Asian American Donor Program (AADP) is a 22-year-old nonprofit organization, based in Alameda, CA, that works to educate community members about the shortage of ethnic marrow/stem cell donors and the importance of joining the registry. It is the oldest nonprofit of its kind in the country. I had heard that there was a shortage of marrow donors before, but for medical reasons I cannot donate myself. I thought about Jeremy’s family and friends, and how if they could, they’d all be the donors Jeremy needs, but since none of them are matches, there’s nothing more they can do except try to find more people to join the donor registry in hopes of finding a match. All it takes is some paperwork and a cheek swab to register, but many don’t realize it’s that easy. I wanted to see what else I could do to help. 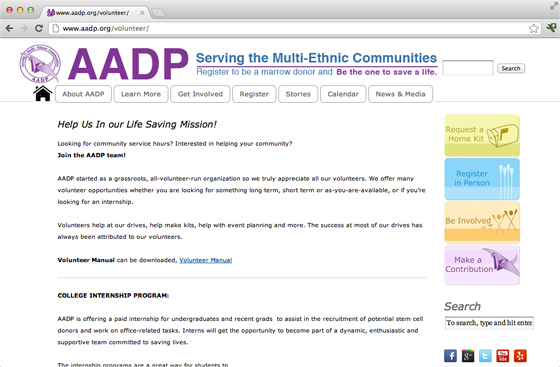 I went to AADP’s website and clicked on their “Volunteer” link. I thought maybe I could help volunteer at a drive, or maybe make home-registry kits, but as I looked down the page, I noticed a new listing – for a “Social Media and Film Production Intern.” The responsibilities and qualifications in this listing sounded just like me – they need someone to help photograph and video patients and donors, to document special events and registration drives, and to interview and write blog posts. I updated my media resume today, wrote my cover letter, and actually *just now* hit the “send” button. Even though I’ve Never Done That is a big project already, I just have to see if they can use my help. If we work together, we can make a difference – for Jeremy and for thousands more like him. *Update: The Kong family welcomed new son Matthew in October of 2012, and also received wonderful news of a donor match for Jeremy. While the transplant was successful, Jeremy’s Leukemia relapsed early in 2013 and the world lost a beautiful bright light later that year. The Kongs were blessed by the St. Jude Children’s Research Hospital during Jeremy’s fight, and they have continued to support the hospital, most recently raising over $20,000 for their Give Thanks Walk with their family and friends team, Team Jeremy. I was on the potential donor list for many years until I, too, had to be removed for medical reasons. It’s good of you to want to help this very worthy cause.